A 3rd generation AVT™ (Advanced Valve Technology) modulating valve is installed on Sentra temperature control units manufactured starting in March 2002. This document describes the design changes and their inherent benefits. The chart below compares the AVT™ cooling valve introduced in 2002 with the valve introduced in 1996. 2002 AVT™ Valve : Valve : Valve body is stainless steel. Benefit : Longer life, less prone to contamination damage. 1996 AVT™ Valve : Valve body is brass. 2002 AVT™ Valve : Designed for modulation valve duty. 1996 AVT™ Valve : Modified for modulating valve duty. 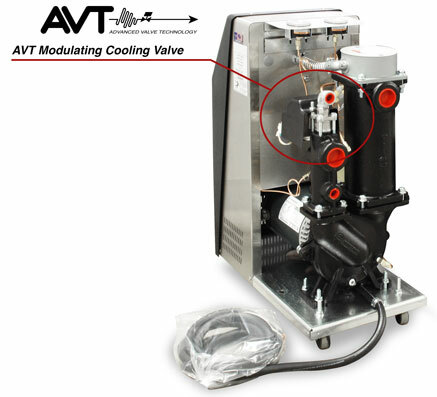 2002 AVT™ Valve : Utilizes O-ring for stem seal. Benefit : Longer life. The O-ring is replaceable in the new valve at a cost of about $5. The '96 valve has a packing nut that must be tightened periodically to stop leaks. Tightening the packing nut increases the torque required to turn the valve adding to stress on the drive system. Field rebuilding of the '96 valve is not recommended. Valve and coupling replacement cost for the '96 valve is approximately $65. 2002 AVT™ Valve : Square drive stem. Benefit : Allows for the use of one piece coupling that provides better control. 1996 AVT™ Valve : Threaded drive stem. 2002 AVT™ Valve : Valve has mounting flange allowing the motor to directly mount for easy alignment. Benefit : Provides more rigid mounting and eliminates alignment concerns (uneven stem wear), provides longer life and better control. 1996 AVT™ Valve : Valve body has no mounting flange which requires the motor to be mounted separately on the casting making alignment critical. 2002 AVT™ Valve : Mounting flange and square drive stem allow a one piece extruded coupling with NO set screws. Benefit : No chance of set screws loosening to cause sloppy control. 1996 AVT™ Valve : Mounting geometry requires a two piece coupling with 4 set screws. 2002 AVT™ Valve : High temp ABS drip cover. Benefit : Sleek, high tech look. 1996 AVT™ Valve : Aluminum drip cover. For more information about AVT modulating valve for temperature control units call the Advantage Sales Department at 317-887-0729. Would you like to Download FYI #248 to your browser?